In Medieval times, warhorses wore crotals. Symbols of wealth and prestige, the single bells were made of silver or gold. Archaeologists have discovered crotals in England dating back to the time of the Roman Empire. Englanders viewed them as protection against evil and disease. Some believed the bells brought wealth and good fortune. Through history, horse bells became regular ornaments for wagons or sleighs passing through the country for both sentimental and practical reasons. The ancient myths of the bells attracting good fortune increased their popularity, but their practicality warned pedestrians and other drivers on narrow roadways. Sleighs are more difficult to stop than wagons, and in some places the law mandated that all sleighs have bells. In the early 1800’s a thriving sleigh bell industry sprung up in East Hampton, Connecticut. The popular bells produced there were sold throughout America. In Medford, Massachusetts, sleigh races became a fashionable winter entertainment. The spectacle of jingling bells and horses straining for speed over the snow inspired lively spectators and even betting. 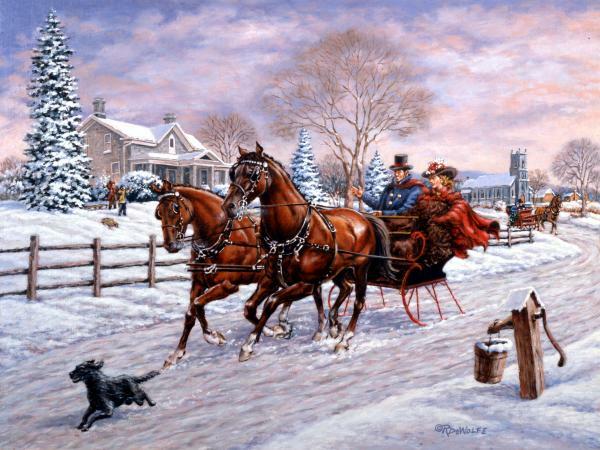 The races inspired a visitor from Savannah, Georgia, James Pierpont, who wrote the song we know as “Jingle Bells;” although, he titled it “One Horse Open Sleigh.” He first wrote the song in the early 1850’s, and it captured a spirit of seasonal joy with a hint of young love. After returning to Savannah and becoming a church choir director, he used the song in a Thanksgiving youth program. It was so well received that the song was performed again at Christmas and has since been associated with Christmastime. It was published in 1857. Instantly popular, “Jingle Bells” is one of the most-loved Christmas songs in America. It has also been translated into many languages and is a popular winter song worldwide. For more on Jingle Bells, read here. “Jingle Crotals, jingle crotals, jingle all the way!” Sorry, just doesn’t have the right “ring” to it for my taste!